But on an XVI HD and potentially other HD computers, you might get a black screen. This tutorial will show you how to fix this problem. Boot up the computer while holding the CLR button. If you get a screen asking you to initialize the SRAM, press Y. You can also verify you have a good working computer by pressing the INTERRUPT button on the top. If Japanese text pops up, then the video subsystem and system ROM is working correctly. It seems the HD version of the X68000 computers requires a hard drive to boot. 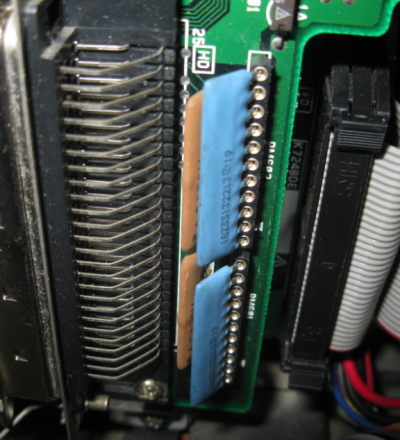 The SCSI hard drive chain beings at the bottom I/O board, it connects to the external I/O adapter and lastly ends at the internal drive. The end of a SCSI chain must always have terminating resistors. Internal hard drives, or external hard drives/CD-ROM drives will have these at the end of the chain. If you don't have any SCSI devices connected, the system ROM hangs waiting for the SCSI device. 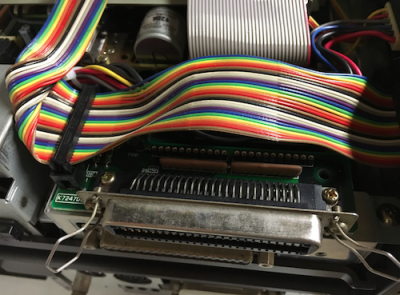 Here's how an externally terminated connector will look like, when it's terminated internal to the X68000. 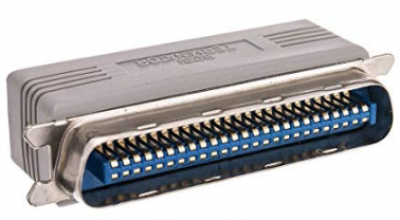 Installing an external terminator on the SCSI-1 connector (Centronics 50 pin male external passive terminator) should also close the SCSI bus and make the floppy drives bootable, preventing the boot ROM from hanging the system.